The Black Keys tread on a thin, gray line in music. By this, I mean that the duo has somehow formulated a sound that appeals to an array of music fans in several genres. They’re a name indie, alternative, blues, and rock hold dear, and with good reason. They’re a name you’ve likely heard, and it’s probable that you’ve somehow stumbled upon a song of theirs without even knowing it, or heard something they’ve written. Or maybe their frequent gracing of Rolling Stone covers would jog your memory. I’d be doing the band a disservice without first briefly delving into their history. This Midwestern duo comprised of Dan Auerbach and Patrick Carney hails from Akron, Ohio. The two met in high school- an unlikely pairing from the beginning. It was the classic, yet atypical pairing of the geek and jock, who somehow bonded over their mutual love for making music. Carney took to the drums while Auerbach sang, played guitar, and wrote. What started as garage band endeavor transitioned along with their sound. Their debut album, The Big Come Up, was released in ’02, flaunting a bluesy-rock sound unique to their beginning and reflective of their youth. The two began to tour the states in a humble Chrysler minivan, later inspiring the album art of the incongruous El Camino cover. To digress for a moment: Carney’s brother creates the band’s Grammy-winning album art- another aspect of the band worth a nod. So back to the basics- With each album, their sound began to evolve- some of their older work being hardly recognizable to newer fans, if not for the indistinguishable guitar riffs and voice of Auerbach. A year later, their sound was tweaked yet again with Thickfreakness after signing with their first label. Scraping guitar riffs and turbulent drums pay tribute to the classics, delving into heavier blues and rock. This album is perhaps the closest to a 180 from their newest album. But I’m going chronologically here. To me, this album spurred the inimitable strumming that I never fail to differentiate. Remaining true to their album-a-year work ethic, Rubber Factory reared its head in ’04. Carney’s drums became more prevalent, and the garage-y, textured sounds became more refined. Still, that sound that was so evident but hard to put your finger on was there. It was that same sound that spawned success, and they remained loyal to it. Songs like “Girl is on My Mind” had new listeners entranced. It was the grunge-y sound you’d picture at a run down bar, that for some inexplicable reason, you loved. “The Lengths” showcased a capacity for slower, stripped down chords- a sound they’d later revisit and expand upon. 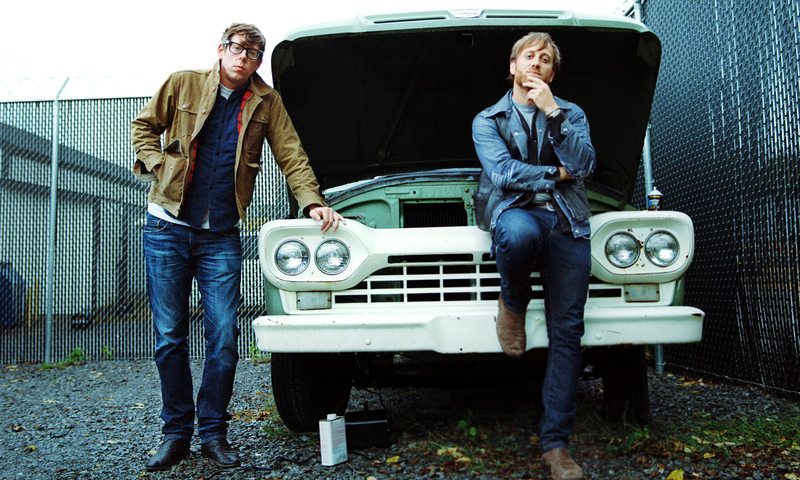 The Black Keys slowed down, by their terms, releasing their next albums in ’08 and ’09. Attack and Release was the most notable of these albums. Songs like “Oceans and Streams” and “Strange Times” continued to build upon Carney’s involvement, and put forth cleaner, more indie-friendly sounds. The grunge-y, garage blues sounds had become further in the rear view mirror at this point. Auerbach began to collaborate with one of the biggest names in the business, producer Danger Mouse, who was named one of the most influential people of the century by Forbes. The next three albums are largely what define the band’s success today- all monumentally different from one another as well. Here continues the symbiotic relationship between the duo and Danger Mouse and for whatever reason, begins a mental divide I have created in organizing their music. Brothers ushered in commercial success for the duo. Almost every song on the album was critically acclaimed, “Tighten Up” being their most successful single up to that point and awarding them three Grammy’s. Their follow-up album, El Camino, peaked at number two on the Billboard 200 chart, with the single “Lonely Boy” earning them three more Grammy’s and spawning their first arena concert tour. Their most up to date album, Turn Blue, released last year, had critics scratching their heads. In typical Black Keys fashion, their sound had evolved again- this time delving into psychedelic rock. The album became their first to debut at number one in the US and Australia, with critics commenting on Danger Mouse’s growing influence on the pair. The album reflected a slower melancholia as its creation coincided with Auerbach’s divorce, further departing from the band’s initial blues-rock sounds. Having had the privilege of seeing the tour first-row myself, I can vouch for the band’s absolute impeccable talents and charisma live. It also happens to go down as the best concert I’ve been to, but that may be beside the point. The Black Keys are one of those rare finds that dances that thin line. Maybe its because of the evolution of their sound and versatility in mixing genres. Or maybe it’s that definitive sound to their music that they never cease to incorporate- that same one that truly is indescribable. What I can’t articulate, their record sales illustrate. They’re one of those not-so-hidden-anymore gems that has something for everyone. Catch Rolling Stone’s latest documentary here on the Keys. Catch up on our favorite TV shows here. Looking for some spots to dine at? We’ve got you covered.